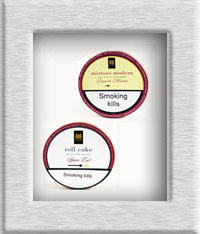 Buy Mac Baren Pipe Tobacco at cheap prices from Cigar Connoisseur, Specialist Tobacconist, based in the UK are in many flavours including MacBaren Mixture Modern, Navy Cut, Dark Twist, Roll Cake, Black Ambrosia and Golden Ambrosia. Made from choice, fully ripe and matured Virginia Tobaccos. An elegant flavour, with a full and pleasant mild taste has been added. A Blend of fully ripe Burley and Mature Virginia Tobaccos results in a mild and aromatic smoke.